Excellent diffusion characteristics CD4 tile. 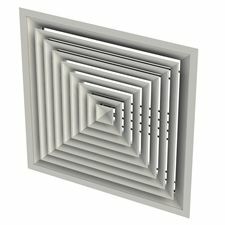 Now with a shallower profile, new blade design and hence a lighter weight, Air-Precision Series CD Louvre faced ceiling diffusers blend seamlessly into modern office and commercial building ceilings. Custom blow patterns can be created through the use of our five blow formats. Frames have punched in corners, in addition to welded joints. Aluminium tube supports blade cores inside frame. Blow Patterns: With one, two (opposite & corner), three and four way blow diffusers available, well considered diffuser placement can provide efficiency gains. Using a three way diffuser when placed next to a wall for example, will mean no air is directed needlessly at the wall.